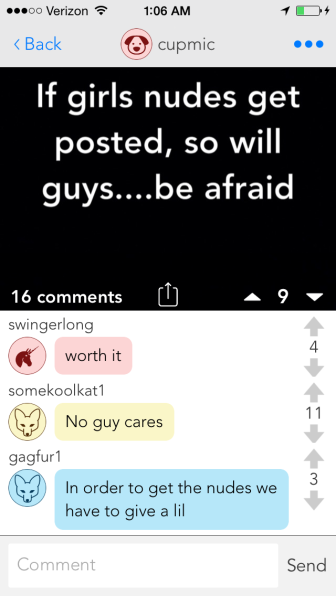 Just as New Canaan High School administrators renew a “geo fence” that prevents the use on campus of Yik Yak—a smartphone app that some students last year used to post derogatory and often graphic comments about others, anonymously—a new mobile platform has emerged that offers all of that plus photos. 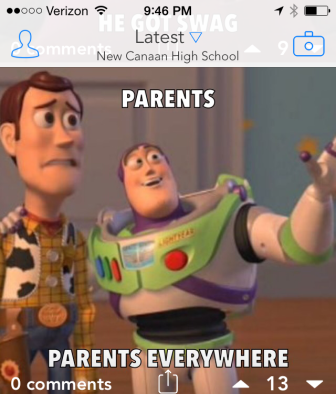 One screenshot from a busy night on the Streetchat feed assigned to “New Canaan High School” on Sept. 29-30, 2014. 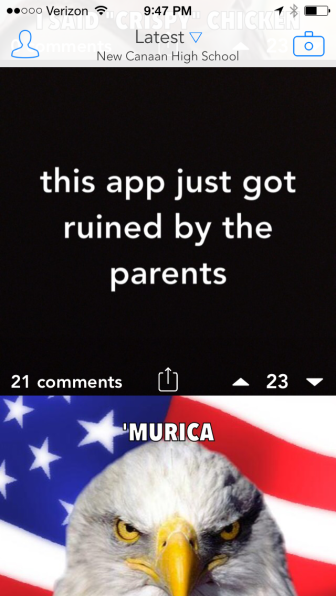 The app—described by its creators as a “live photoboard for schools and colleges”—streams a feed of images overlaid with text for a specific institution, as well as comments. 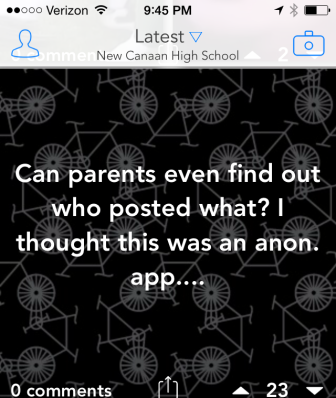 Anonymous posters in New Canaan High School’s feed, as word spread late Monday that parents had learned of the app and were watching the stream, discussed the prospect of a ban and some suggested different feeds that NCHS kids could jump to should the company make good on its threat and pull down the New Canaan feed. 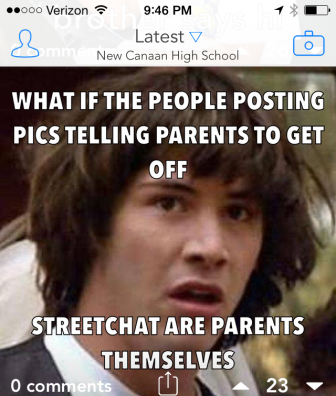 Streetchat officials were not immediately available for comment. 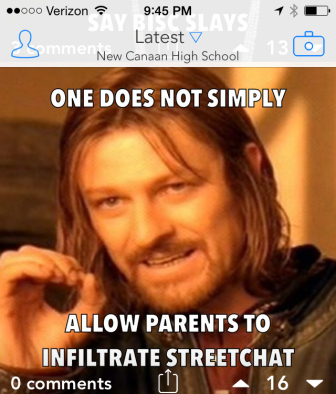 The emergence of Streetchat—quick, free, downloadable, immediate, photo-friendly, mobile and anonymous—illustrates well the challenge of tackling a problem whose solution, district officials say, requires involvement not just from the school but the community at large. 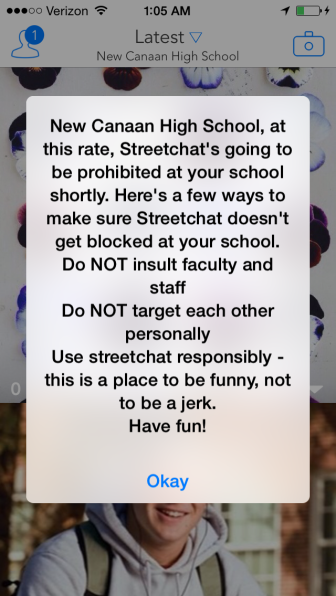 The district’s approach to addressing cyberbullying through apps such as Streetchat can be described as a combination of reactive and proactive. 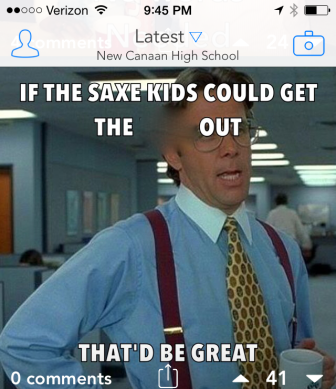 When it happens, administrators ask students to notify them immediately and then launch an investigation, while encouraging parents, should they feel it’s warranted, to contact New Canaan Police (who may conduct their own, parallel investigation). “While we don’t accept reports anonymously, we do accept them confidentially,” Luizzi said. 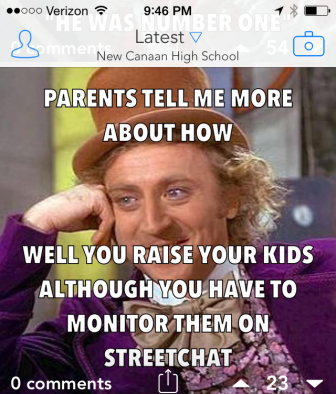 Administrators determine on a case-by-case basis whether and just how to communicate problems such as those caused by emerging mobile apps to parents. 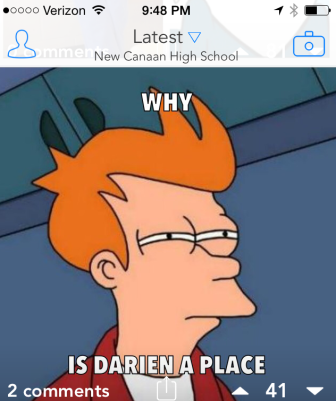 Though problems with mobile apps in the hands of irresponsible teens—particularly those that use geo-location services offer up a kind of anonymous digital corkboard (Yik Yak) or are attached outright to a school (Streetchat)—may be exacerbated on a campus such as NCHS, addressing the wider problem of bullying social media and smartphone use requires “a whole community effort,” Luizzi said. Resources for parents also include a section in the parent handbook that deals with bullying and harassment and how to report it (here’s a form available online that can be used for reporting), and Luizzi said he encourages families to work through situations at home by role-playing scenarios around cyberbullying. In school, a core group of teens including leaders in the student body meet periodically under Athletic Director Jay Egan and other faculty members to talk about improving the culture there, Luizzi said. Asked about his role in connection with cyberbullying, Egan said that last year when Yik Yak emerged, he pulled together a group of the captains of sports teams at NCHS to discuss what was happening and how they as role models could help improve behavior. Similarly, adults that include members of the PFA and PTC share in meetings about what’s going on with respect to social media abuse, Luizzi said. In addition, the district’s School Climate Coordinator regularly meetings with a team of teachers, counselors, social workers and administrators to talk about what’s happening with bullying and what’s being done about it. When Yik Yak became a problem last year, the district contacted the company and ended up putting up a “geo fence” around the school to prevent the app’s use on campus, Luizzi said. That tool appeared to have expired some time over the summer, so Acting Principal Dr. Veronica LeDuc on Thursday took steps to renew it, Luizzi said. Because social media apps are widely available and so much of their use happens outside of school, too, the district will continue to focus on changing the culture of cyberbullying, Luizzi said, even among those who have perpetrated it.